Neutropenia is when a person has a low level of neutrophils. Neutrophils are a type of white blood cell. All white blood cells help the body fight infection. Neutrophils fight infection by destroying harmful bacteria and fungi (yeast) that invade the body. Neutrophils are made in the bone marrow. Bone marrow is the spongy tissue found in larger bones such as the pelvis, vertebrae, and ribs. Some level of neutropenia takes place in about half of people with cancer who are receiving chemotherapy. It is a common side effect in people with leukemia. If you have neutropenia, practice good personal hygiene to lower your risk of infection. This includes washing your hands regularly. People who have neutropenia have a higher risk of getting serious infections. This is because they do not have enough neutrophils to kill organisms that cause infection. People with severe or long-lasting neutropenia are most likely to develop an infection. Neutropenia itself may not cause any symptoms. Patients usually find out they have neutropenia from a blood test or when they get an infection. Some people will feel more tired when they have neutropenia. Your doctor will schedule regular blood tests to look for neutropenia and other blood-related side effects of chemotherapy. An important part of cancer care is relieving the side effects of treatment. This is called palliative care or supportive care. Talk with your health care team about any symptoms you have, including any changes in symptoms. The timing of the drop in neutrophil levels is based on the type or dose of chemotherapy. Neutrophil counts generally start to drop about a week after each round of chemotherapy begins. Neutrophil levels reach a low point about 7 to 14 days after treatment. This is called the nadir. At this point, you are most likely to develop an infection. Your neutrophil count then starts to rise again. This is because your bone marrow restarts normal production of neutrophils. But it may take 3 to 4 weeks to reach a normal level again. Your doctor may recommend antibiotics during longer periods of neutropenia to try to prevent infections. If chemotherapy causes neutropenia with a fever, your doctor may give you medications called white blood cell growth factors. These drugs help the body make more white blood cells. Read more about ASCO’s guideline on white blood cell growth factors. 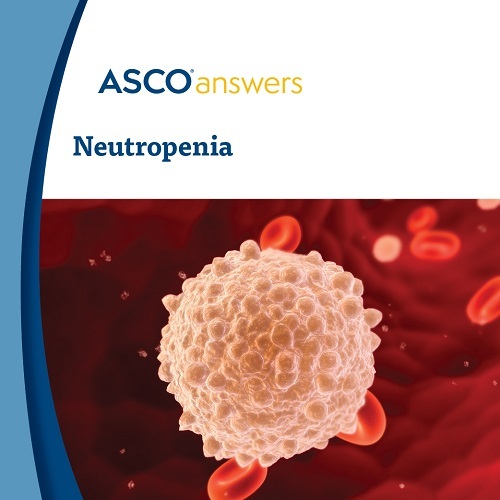 Download ASCO's free Neutropenia fact sheet. This 1-page printable PDF introduction to neutropenia includes possible causes, symptoms, how it is diagnosed, treatment options, words to know, and questions to ask the healthcare team. Order printed copies of this fact sheet from the ASCO University Bookstore.